Volunteers work on the Mesquite Trail in Edwards on Sept. 19 during Vail Resorts’ annual Epic Promise Day (David O. Williams). Editor’s note: A version of this story first appeared in The Colorado Statesman. On any given weekend in many popular parts of Colorado’s national forest, you’re just as likely to run into a volunteer trail crew as you are deer, elk and moose cavorting amongst the aspens. This weekend, for instance, the statewide nonprofit group Volunteers for Outdoor Colorado will be bringing a crew of hopefully up to 100 trail volunteers to Minturn to help the U.S. Forest Service revamp a popular section of trail known as the Minturn Mile. The trail connects to the Back Bowls and Game Creek Bowl on Vail Mountain, and is popular as a backcountry ski route in the winter. But in the summer the steep trail offers great hiking and biking out of the historic railroad town of Minturn off the backside of Vail Mountain. The trail is so close to Interstate 70 and one of the most popular ski resorts in the nation that it has literally been loved to death, eroding and disintegrating into a brush-snarled, rocky clamber that’s become increasingly difficult to navigate for bikers, hikers and even horseback riders. VOC, working on this project with the Eagle-Holy Cross Ranger District of the White River National Forest and the Vail Valley Mountain Bike Association, does about 60 trail restoration projects a year on public lands throughout Colorado. That’s a good thing, says Eagle-Holy Cross Deputy District Ranger Aaron Mayville, who has just two trail-crew workers for 400 miles of trails in his district. His agency’s budget has plummeted by a third, from $27 million in 2010 to $15.5 million this year. If trails become too degraded and unsafe, with streams running down them, overgrown brush and loose rock (or baby heads in mountain-biking parlance) making them unrideable, they have to be closed to the public. That’s why volunteers do so much of the heavy lifting for the Forest Service these days. With 10 million visitors a year, Colorado’s White River National Forest is the most visited in the nation for outdoor recreation. But funds for building and maintaining trails and other means of public access, such as campgrounds and Jeep roads, have steadily declined as visitor numbers skyrocket. This year, for the first time ever, the Forest Service spent more than half of its budget – or just over $1 billion — on fighting wildfires around the country. Volunteerism has become increasingly vital, Mayville said last month at a trail restoration project in Edwards staffed by more than 300 Vail Resorts employees as part of its annual Epic Promise Day. “We just don’t have the resources to really get to every stretch of trail like we’d like to, and so volunteer groups and volunteer projects like Epic Promise are just a great way to get a lot of great work done that we probably wouldn’t have gotten to otherwise,” Mayville said, adding his district has many valuable partnerships with groups such as Vail Resorts, the VVMBA and VOC. 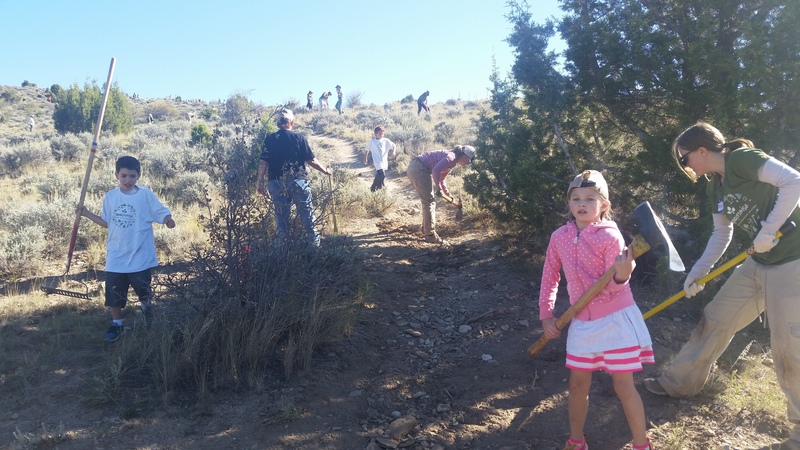 The number of families with kids working on the Mesquite Trail in Edwards encouraged Mayville that the agency is fostering a sense of stewardship with future generations, something the USFS has also been trying to do with its Kids in the Woods program. VOC is seeking up to 100 workers for its Minturn Mile project Saturday and Sunday, Oct. 3-4, near Minturn. Volunteers should register in advance so organizers can have enough tools, supplies and food. Register via the Volunteers for Outdoor Colorado project calendar at www.voc.org/projects or call (303) 715-1010.